Or biking either. 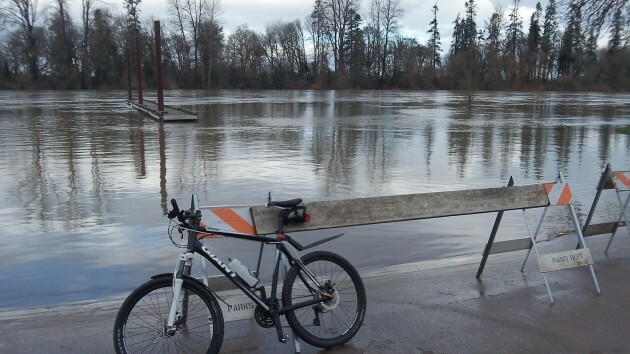 The parks department put up barriers at Albany’s Bowman Park, just in case anybody was tempted to venture into the Willamette River to reach the floating dock out there. This was on Sunday afternoon. According to the level on the Albany gauge, just above 18 feet, the river was running at the rate of about 53,000 cubic feet per second. The level was down from about 20 feet on Christmas Day. It never got even close to the flood level, which is 25 feet. Based on the forecast — much lower temperatures and not much precipitation — the National Weather Service projects the river level will continue to decline over the next several days.